Instant Signs and Labels, from 10cm up to 20cm wide – in multiple colours – in one pass! The New Kodiak from Rebo Systems. Rebo Systems introduce the new, multi-colour Kodiak in-house safety sign system. The Kodiak has two print heads for multi-colour printing and can print from 10 up to 20 centimetres wide, giving fast, single pass printing for everyday signage, labels, GHS chemical labels and more. The Kodiak is a stand-alone system, with an integrated touch screen and in-built applications for fast, productive sign and label production. 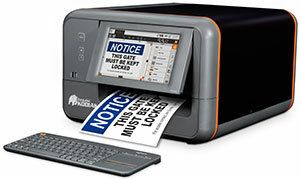 In addition the Kodiak can be connected to a PC if required, having its own print driver available. One system can create all your signs and labels in ten year durable outside vinyl, complete with graphics, custom texts and with the additional benefit of more than just one colour. Sign templates are in-built for ease of design and a full GHS database is also integrated into the system, complete with layouts, to create fast, effective warning labels. Having a range of material widths means no wastage and greater versatility – including pre-printed materials that will boost the effectiveness and usefulness of this unique system. Changing ribbons and supplies is fast and effortless, creating and printing are virtually seamless and the print speed is astonishing. Productivity, added safety and a larger message – all complete in the new and unique Kodiak from Rebo Systems. The New Kodiak gives you: Standalone – network free, network connectable, Wi-Fi enabled for auto updates, Slide in ribbon cassettes, Wi-Fi keyboard, incorporated GHS database and layouts, sign templates, pipe marking, Arc Flash, Int/EU symbols included. This entry was posted in News and tagged Health & Safety, Printing. Bookmark the permalink.